Made this card for my granddaughter, can't believe she's 14 already. Oh! my where did the time go? I used some paper and ribbon from my stash and the stamp is from SU set called Sassy Sentiments. I'm liking this one. I'm having my first S.A.S. this Wednesday. It's a full class! Yippee!! I only have one spot left in the December workshop. I've been busy putting together the classes for 2014 can't wait to share a few samples. Have a great Monday! Well you know by now I love Washi tape! I had to pull some out and play today. I used a few background stamps from my stash and the sentiment is from SU. I think this will help brighten someone's day who's maybe under the weather don't you? Today is my last class at Michael's. I'm doing a scrapbooking 101 using punches and Project Life cards. Should make for a fun morning. I'll being more classes in my home beginning October. This is a WARNING TO ALL!! DO NOT use your magnetic platform in place of your multi-purpose platform. I used mine BY MISTAKE!!! when I was embossing with an embossing folder and busted my Vegabon machine. BUMMER!!!!!!!!!!! I'm sharing my mistake to hopefully spare others for a costly loss. It looks like a multi-platform base plate as far as the thickness.. however it is ever so slightly thicker. Enough to break the Vegabon. I realize there is a picture on the front showing the layering for thinlet dies, I just didn't think and grabbed it to emboss. There is no warning label that I could find that says DON'T use as a multi-purpose replacement, and I read a lot of messages on the Splitcoaststampers forum where people made mention that they thought this was going to be a replacement for the multi-purpose platform, since it had been discontinued. IT'S NOT! Being a crafter for over 30 years, my thoughts are, if I made this mistake I was concerned "NEWBIES" might too and what a big chunk of $$$ goes out the window. I hope this saves someone from such a loss! I emailed Sizzix to alert them to this and of course, I hope they will either repair or replace my machine. As much as I truly doubt it, one never knows. Here's hoping for a better crafting day! You all have a great day!!!! This is one of the cards on my sample board. I've made two of them to use at the workshops. I found these really cool clips that are stationary and I can exchange card samples really quickly and NO tape. This is using a stamp from the Ronald McDonald special set. Every purchase of this stamp set bought, three dollars will be sent to the Ronald McDonald House. I love to pay it forward don't you? I also used my Spellbinders dies and a Cuttlebug embossing folder. Hope you have a great day! This is a card I threw together using scraps. I also used the stamp set from Stampin' up. Hope you're having a great day. This is the new Photopolymer stamp set! I love the spider web. I'm not too much into the whole Halloween scene but I thought I could use the spider web on a birthday card for an "old" friend" LOL you can order this on my SU Website www.createwithbubbe.stampinup.net , go to the shop button and off you go. Hope you have a great day! Just wanted to share a quick card with you. This was made using the six-sided stamp set, embossing folder and punch. The ribbon is from May Arts ribbon. I bought a big die from Accucut that is six-sided shapes, but bigger than these that I plan to use for scrapbooking along with this one. I'll share once I get it completed. Hope you're having a great day! This board shows 12 different cards you can make using the Mosaic Madness Bundle. My goal is to share with you, all the different things you can do with just one bundle set. As I've said in the past I love the bundle sets Stampin Up offers for several reasons. First the variety, then there's the price 15% off, the quality of the products, of course, and then the fact that there is a punch to match the stamp. So, NO MORE cutting out the shapes. You can check out all the different bundles they offer at my website. "Hostess Thank-you" gift packs. Oh yeah! and Christmas is coming and I have always given card packs for gifts. This year they'll all get a mixture of Stampin Up designs. Hi Everyone! I said I would take some photos at the Open House and share, well, here is one of the sample boards. Thanks to all those folks that share their ideas on Pinterest and Splitcoaststampers!! I put this together for folks to get an idea of what you can do with some ink, paper and stamps. I ended up making two boards, so I'll share the other tomorrow. Have a great day! The long awaited return of the Magnetic Platform. It's back in Stock :) I already ordered mine! Oh boy! SU hit a homerun with this one! I haven't put down my new envelope punch tool since it arrived this afternoon. I now have a pile of square envelopes, long envelopes, notecard envelopes, letter sized envelopes. You name it - you can make it! 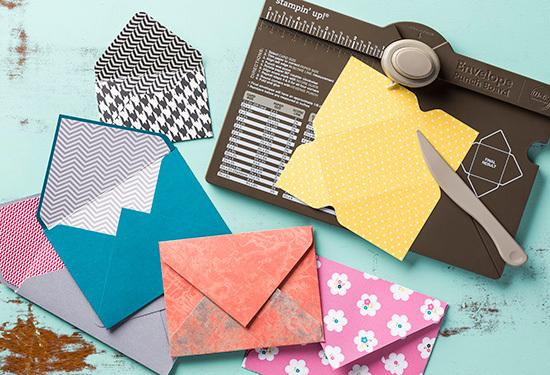 Create totally customizable envelopes in up to 66 different sizes (not to mention a million different color and pattern options depending on the paper you want to use). Even tried and true envelope sizes will only take you moments to create! It's super easy to use. It looks intimidating at first glance, but when you see that all you have to do is measure for the first punch and from there you just turn and score. It's small and lightweight and very portable - you could use it while watching a soccer match, at a park, at a friend's for craft night-anywhere. 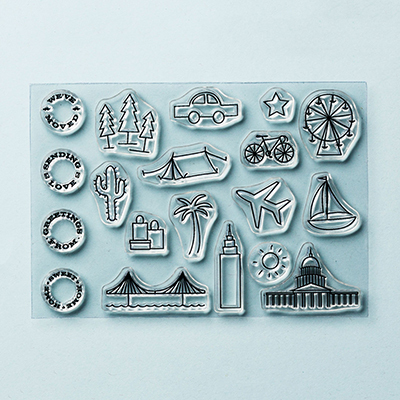 These are the newest Photopolymer stamp sets I mentioned the other day. If you'd like to see the others that are available you can go to my website, hit shop, then photopolymer stamps. I'll try to keep you all up-to-date with all the happenings at Stampin Up. They are doing so much more than they did many years ago when I was a demonstrator, it's pretty exciting. Thought you might like to know this. I've ordered my first set and I'm anxious to use it. I agree with the fact that some of the other clear stamps are so fragile, I've torn some and I've even returned some because they were so expensive and I got bad images or they would tear. I'll let you know when I get them, and I'll make some samples. 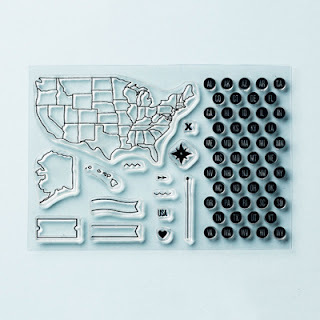 Stampin UP just came out with two new sets this week. I'll post them later today for you to see. Hope you enjoy the video there will be more. Here's one of my posters for Friday's Open House. I used my Cricut to make the letters. I thought this would be a great way to share with my friends and customers what I plan to do now that I'm a Stampin'UP demonstrator. I plan to have a monthly S.A.S (stamp a stack workshop), W.J.O.S. (with just one stamp) and W.I.N.O.S. ( women in need of stamping) and of course workshops for those who would like to earn free Stampin'UP products. Now, I'd like to make sure you know that I didn't come up with the titles of these workshops! I borrowed them from other talented SU Demonstrators. I am so lucky to have good contacts in my upline. Thanks to all of you for sharing and helping me! I will share my other display boards over the next few days. I have had a great response to my Open House it lends itself to be a great night of card making fun, snacks and door- prizes. Hope to see you there. OH YEAH! I got my Paper Pumpkin today! I'm going to do a video to show you what's in this month's kit. Check back! Can you believe this? He thought we bought this new couch for him. Well, maybe we did. Thought we could all use a smile. Have a great day! This is a quick little card I threw together yesterday. I was doing a little cleaning in the studio and came across a box of scraps and odds and ends. This is what I came up with. Why not give it a try... not the cleaning part LOL using some scraps to make a cute card. Have a great day! I just got a new die cut from Accucut and the Christmas Collectibles Bundle and used it to make this awesome card. This will be one of the cards we'll make at the December Stamp-A-Stack. I love those bundle sets. If you'd like to get yourself one go to my website and hit "SHOP". Have a great day! I also wanted to respond to one of the comments on the "old" blog. Yes I will leave the old blog there so folks can check back through the archives and yes I still work for Cropstop and the videos will be seen at www.cropstop.com (Youtube) I will also be doing videos on my own YouTube channel starting in the next few weeks. I hope this answers all the ? out there and you will all enjoy this blog as much maybe more than before. It will NOT just be an info-mercial PROMISE!! I will continue to share new tips and ideas while using the SU products. I use LOTS of other products myself and hope you all will too. My pitch is to add to our resources to create not get rid of or replace. Like in the card shown here, I used an Accucut die and tinsel from Hobby Lobby. I hope this makes sense. I would hate to make anyone think that I've thrown out all my other arts and craft tools and toys and only have SU, there is a wealth of great products out there Stampin' Up is just one of them. Here's one of the samples I'll be sharing at the October S-A-S. I used the #131775 (clear) Christmas Collectibles and #132152 Christmas Ornament Punch (both in the Holiday Catalog), #116824 Petals -a-Plenty embossing folder on the card base and the # 117335 Perfect Polka Dots embossing folder on the ornament. The "Merry Christmas" is from a very old Stampin Up set. I've put together a sample board for each of my S-A-S workshops, showcasing one stamp set, embossing folder and/or the matching punch. I have to tell I LOVE the "bundles" SU now offers. That extra 15% off the bundle helps cover the shipping and handling we have to pay. Hope you're enjoying the new blog and SU website! FYI I went to the Sizzix website and you can use this in your Vagabond machine, just in case you were wondering. Okay now have a great day! Welcome to my new blog. This will be a place to stop by to see both new and old ideas, techniques and share Stampin Up products and promotions. I signed up to be a SU Demonstrator August 15th and things are really starting to roll. I have my first OPEN HOUSE September 20. I've spent hours on end searching for card ideas using my new stamps and punches. There are so many talented folks out there it was hard to not want to make them all. I even started a file on my computer to save tons of ideas. I searched the SU Demonstrators gallery over at Splitcoaststampers and Pinterest, both places are awesome inspiration! Thanks to all those who share what they come up with so we can have fun creating and putting our own twist on them. So, here's the deal... I plan to post daily just as I have in the past (pretty much everyday unless "life" happens) Share what I've learned, ideas I've found and make available to you all the awesome Stampin Up products. They really are top notch at Stampin Up. I hope you'll stick around and have some fun with me as I embark on my new adventure. I also have a Stampin Up website www.createwithbubbe.stampinup.net where you can see other ideas and SHOP right on line and have your goodies sent directly to your home. 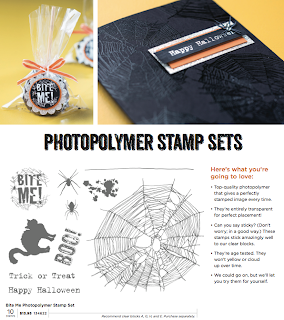 In October I'll be putting together a way for everyone to have a chance to win free Stampin Up products. My up-line, Christina is helping me with that. So, make sure to check back. Now, head over to the website and take a peek! Have a great day! Oh Yeah! this is just one of the cards we will be creating at my first Stamp-A-Stack next month. There are details on the right side of the blog.